This week has been exciting for me! My new cocktail column has begun and I am having a blast creating these delicious adult beverages. You know, because sometimes our kids make us want to drink. Not too much of course, but just enough to make the fire stop billowing out of our ears and to make our horns recede. There really is only so many times you can ask a kid to put their shoes on before you transform. I swear I said I wouldn’t be that mom, but let’s face it, momming is hard and we will all lose it over one thing or another at some point. If you find yourself in that scary mom place this week, check out my Halloween cocktail, the Spooksicle, over on Momtrends. In other news, I am trying to hone in on just what you, the readers, would like to see more of on the site. If you would please leave a comment and let me know I would very much appreciate it! I’m debating between adding more weeknight meals (30 min and under), instant pot meals, or crockpot meals. I understand life is busy and we all need quick fixes sometimes so let me know how you prefer to get you “fix”! All recipes will remain gluten-free, of course. A few weeks ago, when my husband and I went to the cooking class together at Sur La Table for date night. We made these awesome curried pecans to go on a roasted beet salad. 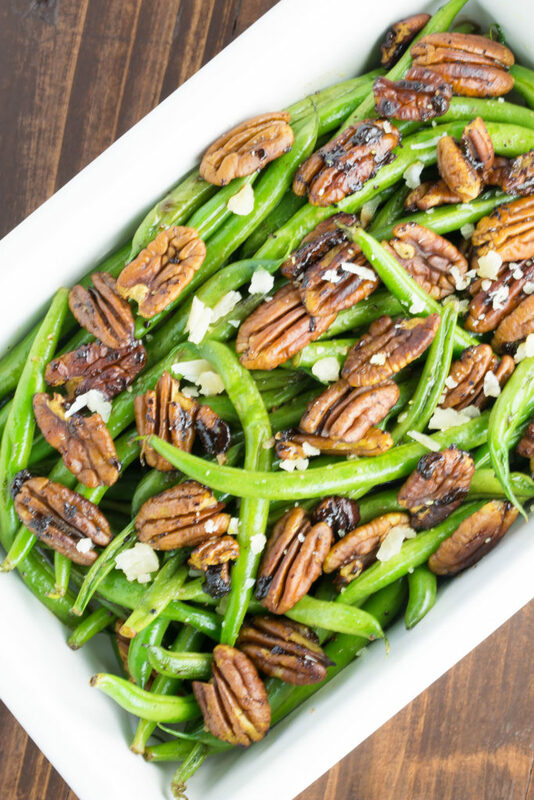 This week I am introducing these pecans to you in this sautéed green beans with curried pecans recipe. These pecans are so warm and toasty, they really take the flavor of these green beans up a notch! In a pan, add 2 tbsp of butter. Allow the butter to melt and foam. WHen the butter stops foaming, add the pecans, salt, sugar, and curry. Mix all ingredients, being sure to evenly coat the pecans. Once the pecans are coated, cook until a nice sheen has developed and the pecans are nice and toasted. Remove the curried pecans from the pan and set aside. In the same pan that you made your pecans, add your olive oil. Once the oil is hot, add the shallot and sauté for about a few minutes (2-3 max). Add the green beans and season with salt and pepper. Sauté the green beans for about 15 minutes, until they are cooked, but still have a nice crunch to them. This isn’t a soggy green bean dish so be sure not to overcook the green beans. 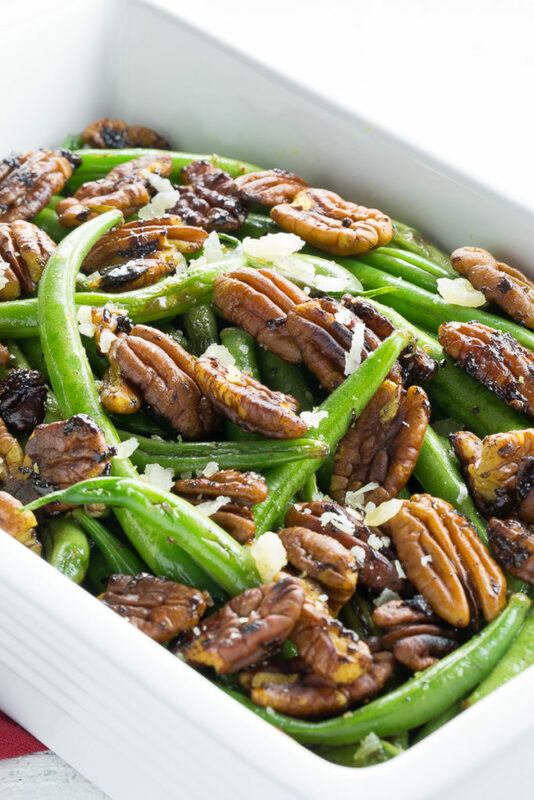 Place the green beans in your serving dish and garnish with the curried pecans and parmesan crumbles. Everyone will love these warm and flavorful green beans!! And, best of all, they come together quickly in one pan and cook in under 30 minutes! Because I adore my Le Creuset, I use this Le Creuset buffet casserole with glass lid for nearly everything, including this green bean dish. THe versatility of this pan is seriously amazing. I don’t even put it up in the cabinet. Its home is on my stovetop. As far as a serving dish goes, I’d choose white serving dishes to make the brilliant green in this dish really pop! Previous PostPrevious Crazy About Nuts: What is the Healthiest Nut? I never would have thought to put these two together! Definitely want to try it, I have fresh beans in the fridge already! RUNNING TO MAKE THIS DISH!!! There’s not much more I love than pecans in a sauteed veggie dish! This looks amazing! Such a unique recipe. And I love how easily I can sub in coconut oil and nutritional yeast to make it dairy free (I’m lactose intolerant). Can’t wait to try! I have never done anything fancy with my sting beans before, but these sound wicked good. My family will like them, too! This looks delicious! I was trying to figure out what I need to put on my grocery list and this looks really really good. What a great idea! I would have never thought to put pecans in my beans before this is fantastic! I love pecans, my husband would tell you I put them in everything, lol! You really know how to sell a side dish. The pictures are so apetizing and those beans look so fresh and crisp. I will keep this in mind for Thanksgiving. Oh man these look amazing! 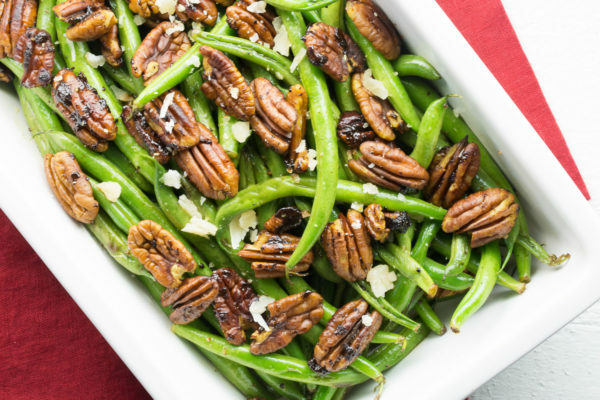 I never really thought to use pecans with green beans, but I am so making this one night next week! That looks so yummy. Green beans are my favorite vegetable. The curried pecans caught my attention. I am used to seeing candied pecans but the curried ones are so different. I am a green bean girl, so the two sound amazing together. Wow what a delicious twist on green beans! I’m gonna have to try this, my husband is a huge pecan lover! I love that you share quick meals and I honestly don’t mind what easy recipes you choose to share. I’ve never made curried pecans before, that’s really interesting! I’m sure the flavor is amazing especially if you add in the green beans. This looks like a fantastic dish! I might try this for Thanksgiving. I personally look for unique casseroles and easy desserts. I think, you are just doing good here. You may add either of the three or all of the three if possible since these recipes are all so useful. Any way, thank you for sharing! I love everything about this recipe. The green beans are so fresh and green, just the way our family likes them. The curried pecans sound like a great twist! We love green beans but I never know how to make them. The curried pecans must add so much flavor! I would never think to add curry to pecans! i wouldn’t have thought about putting curry with my green beans. Sounds yummy and simple to make. Looks delicious! I love curry powder. These green beans must be so yummy with curry powder, pecans and parmesan! I love green beans and this recipe sounds delicious! I’m sure the curried pecans are so yummy! Curried pecans look and sound amazing! I love green beans but don’t cook with me as much as I would’ve loved to. Such a fantastic side dish! Love the amazing flavors of pecans and curry powder. This not only sounds delicious, but looks amazing as well! I love your food photography! I am always looking for ways to spruce up veggies but I have never thought of curry with green beans! Totally doing this! What a delicious recipe! I cannot wait for the next holiday dinner to cook up something special like this one! This sounds delicious. I would not have even thought of adding nuts to vegetables. Such a great idea. I’ve never had curried pecans before. Such a great addition to the sauteed green beans! Can’t wait to try this! Oooh, curried pecans, parmesan cheese, and green beans? Nice combo! This recipe looks delicious. Never thought to add curry powder to green beans! Sounds delicious and I will be trying this! Love these green beans! They are so gorgeous and crispy tender. Just the way i like it! These are the prettiest green beans ever! Such pretty photos. They look so fresh, and then the buttery pecans. How lovely! So many fun flavors here! My girls would think this is so cool – love the parm crumbles!